In 1955, Kaline ended the season with a .340 batting average, becoming the youngest player ever to win the American League batting title. On September 24, 1974, Kaline became the 12th player in Major League Baseball history to reach the 3000 hit plateau. Kaline finished his career with 3,007 hits, 399 home runs, and 1583 RBIs. He batted over .300 nine times in his career to finish with a lifetime batting average of .297. 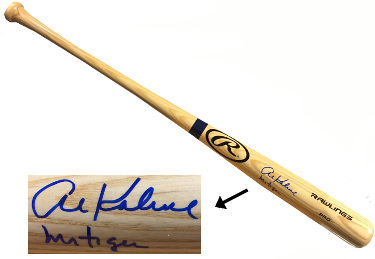 Al has hand signed this Blonde Pro Model Bat with Mr. Tiger Inscription. JSA Witnessed Hologram and Certificate of Authenticity.